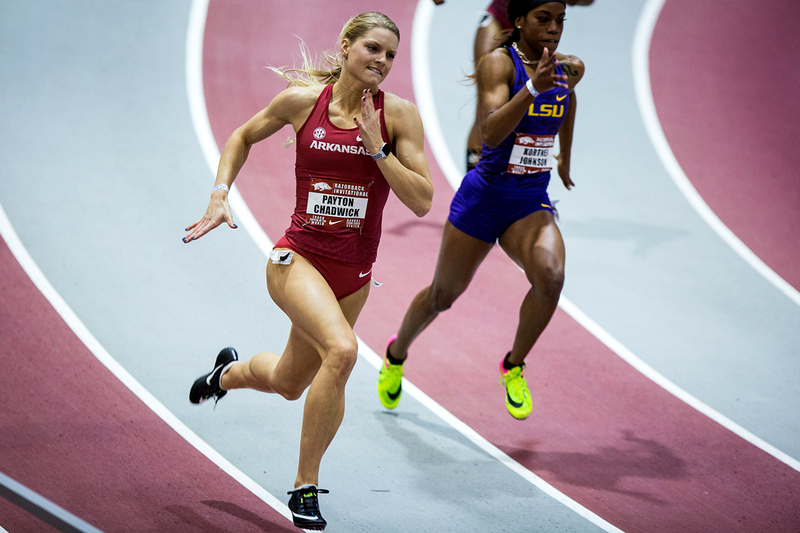 LUBBOCK, Texas – The top-ranked Arkansas women’s track and field team closed out the weekend at the Texas Tech Open in Lubbock, Texas Saturday with a dominant day on the track, while senior Nikki Hiltz placed in the top-10 at the Millrose Games Women’s Wanamaker Mile in New York City. Arkansas began the day with the 400 meter dash, as junior Payton Chadwick made her 2018 debut in the event with a time of 53.74 to place her in the top 25 in the 400.. It’s the first time she’s appeared in the event since the Arkansas qualifier in 2016. The Razorbacks had the top-three collegiate finishers in the event, with Morgan Burks Magee and Sydney Hammit finishing third and fifth, respectively. Burks Magee’s time of 53.77 set a new personal record for the third time this season in the 400 meter dash. Sophomore Jada Baylark was Arkansas’ lone event winner Saturday, taking the title in the 200 meter dash with a time of 23:52. Junior Kiara Parker finished third in the event to join Baylark as the top two collegiate finishers in the race. Burks Magee finished fifth and set a new PR with a time of 24.07. Senior Nikki Hiltz finished ninth in the Millrose Games Wanamaker Mile in New York Saturday, finishing with a time of 4:33.44. Hiltz set a new personal record in the mile in New York, cutting over a second off of her previous personal record of 4:34.57. The Razorbacks return home for the Tyson Invitational next Friday and Saturday inside the Randal Tyson Indoor Track Center.